OVL Twist Lock Adaptor 2" - 1.25"
The Twist Lock Adaptor is an innovative 2″-1.25″ low-profile helical self-centering eyepiece adaptor, of metal construction, threaded to accept standard 2″ filters. 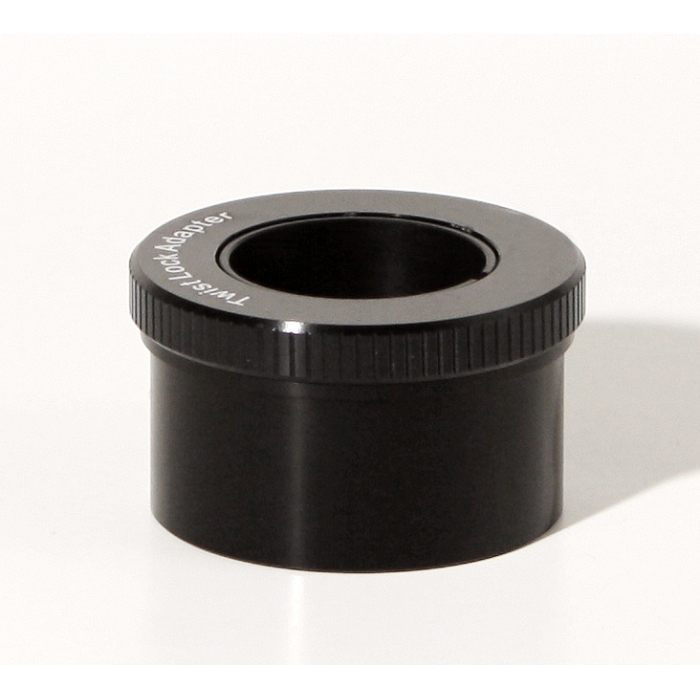 Just twist the upper knurled locking ring and your 1.25″ eyepiece, camera nosepiece, or laser collimator is centered precisely in your 2″ focuser, and securely gripped by a polypropylene compression ring, which will not scratch or mark your equipment. Standard 1.25″ adaptors use a thumbscrew which pushes the inserted accessory to one side when tightened. Not so with this clever adaptor. And wait, there’s more....Unscrew the knurled locking ring to expose a male T-thread on the lower black barrel, which conveniently functions as a 2″ prime focus (2″ to T thread) adaptor by itself. So you’re actually getting two adaptors for the price of one! You’ll want one for every scope!